Completely off topic but wanted to share what happened when we flew from LCY to Mykonos on Monday. Much to my surprise we had complimentary food and drink in economy and to learn that it’s never stopped on City flights. Also, interestingly one of the cabin crew told me that BA is very unhappy with M & S and hinted there may be changes ahead. This is also the case with the CityFlyer flights from MAN. Can concur – we had this in economy on MAN – FLORENCE this month. This really wasn’t a choice by BA, more of a logistical issue. That fleet is separate and has never been trained and switched over to BOB. Probably also linked to the Embraer fleet. Typically the LCY flights cost a little more than LHR ones for same destination, say TXL, so 30p worth of food not making much difference. For London to Berlin, LCY is usually cheaper than LHR in my experience. And there’s usually more avios seats on the LCY flights. I believe it’s to do with space for the relevant trollies on the Embraer fleet, although it was supposed to get resolved before. The Vueling card must be causing some alarm at amex UK. I think many would dump their amex basic card for this given the opportunity. However, more importantly, if as you say somebody still thinks they can make money in these conditions then it is difficult to see BA sticking with amex if they can offer this on visa/MasterCard. Rob, I’ve got the Tesco Premium card and it’s been working well for me. I’ve been awarded my bonus 5000 Clubcard points already so my only question is. Do you know when existing cardholders will be informed of their cancelled cards? Cheers. Tesco may have pulled the card for new applicants, but has it been confirmed that existing cards will be closed? Hi all… wondering if anyone knows the answer: if my daughter living at the same address buys spg points, is it possible for me or wife to pool them immediately for redemptions? Does my daughter need to check in or can we spend them as we wish? Your daughter simply transfers the points to you or your wife for use in your / her acct. They can be transferred from one person to another at the same address using a request form in the online account. However, it is not immediate, it usually takes about 5 working days but last time I got mine in 3 days. To buy points the account needs to have been open so many day but I cannot recall how many, 14 rings a bell. May have been mentioned already but apparently BA are now embroiled in an error fare controversy where a number of pax have booked cheap flights to the Middle East (and, in several cases separate accommodation and car hire) only to have BA cancel the flights citing an IT error. MSE have picked up on it now so it’ll be interesting to see how it pans out. The legal adviser asked for comment calls it a “grey area” even though it’s covered to a certain extent by contract law. Seems a weak position to defend if somebody took BA to MCOL/ CEDR. The Tel Aviv fare is an obvious error with the actual fare component ( so not the taxes and fees ) was minus seven quid..
Ba have been quick to mitigate conflict by offering £100 ( voucher/cash details to follow ) appology to those that booked it. I flew a mistake fare to Costa Rica in business from Malaga via London for six hundred pounds a couple of years back so many of these issues are fully ticketed..
And lastly Martin Lewis talks with broad brush strokes generally (and even more so about travel) – he is spreading himself and his site too thin as he is forced to dumb down to the masses. The voucher details are published. The ‘£100’ is only to be used against purchase of a BA product at the same online travel agent the pax where bought their ticket, with a short ‘book by’ date, end July 2018 I think. So it’s completely mean as a compo gesture. 2. Bookings to be made via the original travel agent. Discount is not available via BA directly or via another agent. It very clearly states the cancellation terms for tickets before you press the “purchase now” button……with value fares this is usually uncancellable. Yet BA as the vendor seem in this case to be ignoring this part of the contract between 2 parties! This would constitute an unfair contract if it can be cancelled without agreement by both parties, and hence a breach of the unfair contract terms act…..
My employer could cancel my contract without my consent. I can cancel any financial contract without the consent of the other party within a defined period. I can cancel lots of contracts with notice. You cannot hold someone to a contract that is unfair. For example, if I signed a contract with a builder to build me a new bog standard garage for £3m it would not be enforceable. Same as if I got them to do it for £1. Lots of shades of grey but what matters here is not typically the legal position but how the vendor handles the fall out. Can either increase customet loyalty or end it. It’s not a grey area because airlines, especially BA, have been unilaterally cancelling mistake fares for years. This is why we don’t write about them. The only grey area here is whether the price is actually not low enough. However, as BA can unilaterally cancel your ticket anyway up to 2 weeks before departure (and often does when routes are pulled, without making any effort to reroute) it is difficult to complain. Talk to those people who booked holidays to Calgary for the winter. But in the latter scenario, there is a legal right to re-routing, no matter how awkward BA try to be about it! It seems to be the case here that BA and other airlines) have the right to cancel the flights without any kind of comeback if they can justify that there was a pricing error. There was a pricing error. You bought a fully flexible ticket, usually four-figures, for £200. A court would throw out your complaint in seconds. There is a cyclicality here remember. If this ticket WASN’T substantially cheaper, you wouldn’t be complaining in the first place, because you could take BA’s refund and buy a ticket with another airline for a similar price. You can’t say you didn’t think it was a mistake but give your reason for complaining as the fact that you can’t buy a replacement ticket for anything like the same amount. How is Joe Blogs the consumer supposed to know that refundable tickets are stupidly expensive? Before being a points geek I had no idea that refundable tickets were 5x the price. I probably had no idea whether the air tickets I bought were even refundable or not. On this basis, the fare is not manifestly an error unless you have a decent level.of knowledge of air fares? Good luck with that in the Small Claims Court. Ignorance (of the truth, not stupidity!) is not a legal defence. OT: hi I just got the plat card. If I refer myself for the nectar card, will I get 18000 points? Yes, according to the experience of many here. However, it would be sensible to wait a while before applying for another card. Can you merge Vueling Avios to BAEC? If you purchase fuel from Tesco, then there is a good reason. You need to search. Virgin are offering a signup bonus and also a monthly spend bonus (including to existing holders)! Had my reward one a while now but get 2000 for £500 spend in each of next 3 months! I got an email from them yesterday too. 5000 miles for getting the card, then 2000 miles if I spend £500 monthly for the next 3 months. Can’t see a reason not to get the card. The small print says you don’t – I think they have just used €10 units to avoid having to talk in fractions. Off topic. Does anyone know how long it takes for Marriot status to update following the posting of the final qualifying night? I am doing the platinum challenge and trying to do it before end of July (in the hope that platinum will move to platinum premier in the new scheme). I am looking at my last stay being 28th July, but am worried it might be too late for my status to update if the points don’t post before end of July. Your status should update as soon as the points/nights post to your account for your last stay of the Platinum challenge. Normally that will happened within 48hrs of checking out. Instant, because I got mine yesterday. Stayed on Saturday at Manchester Airport, points posted Tuesday, status immediately updated to Platinum. Spookily, my linked Starwood status became Platinum too. Thanks Rob! Congrats on reaching platinum! So I am not sure if the maximum rate applies there as mentioned on this site. Certainly you can’t book it via points online. Are Marriott rewards and Ritz Carlton rewards the same thing? I have a gold RC card which was issued in lieu of a gold Marriott card. Can i transfer spg points purchased via the 35% discount to my RC account 3 for one, and then book any spg, marriott or RC hotel at a max of 60000 points per night?? In August, yes. And R-C Rewards won’t exist post August anyway, in anything except name. All points across all 3 schemes are pooled with one new account number. 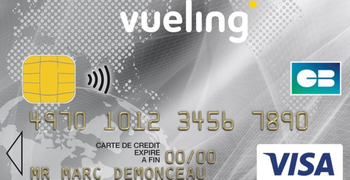 On the Vueling card, I note the Cartes Bancaires ‘CB’ logo. IIRC domestic payment networks are out of scope for the interchange fee cap. While I know CB has some kind of connection to the Visa network, and I’ve not been following the interchange cap in France in any detail, I do wonder if that plays a role in making the economics of the card work – if certain fees are not capped as low for a percentage of the transactions they expect. It might also explain the position on cash withdrawals. But as I said, I’ve not been following French market too closely. The French CB card system used by all the banks there is a bit different, so I don’t know if it is caught in the interchange fee cap. Their equivalent of our debit card is actually a deferred debit card whereby when you spend on it, the sum is immediately blocked on your bank account, but they don’t actually take the money until the end of the month, so a bit more like a charge card as there is no credit involved and it is always paid in full because the money is secured at the time of purchase. That’s weird. Is there any point in them doing it like that? If your current account accrues interest would you get interest on the amount you’ve spent on your card? I was never able to find a current account that offered interest in France, in fact there was a monthly fee of €14 just for having the account; no additional benefits and that is very standard there. There are now more online banks but with the inertia factor, the domestic business of the main French banks is very profitable. Cheques and cash are still used far more than in the UK. I manage to get 6% interest out of La Poste, but I opened the two accounts (Livret A and PEL) 20 years ago during a special offer. Current accounts do not accrue interests in France… old habit in the French market. Livret A and PEL are not current accounts. Interests on Livret A and PEL are not paid on a daily basis. On the Livret A, interests are paid at the end of the year. You need to mouve your funds between those and your current account. You cannot have a credit card linked to a Livret A or a PEL. And the interest on the Livret A is most of the time inferior of the inflation rate. The interest on the PEL is better but you cannot cash it before something like 4 or 5 years or more : it is meant to help you to get a reduced interest loan for buying a house. Then if you manage all those caveats, it may work fine. I do not know if interchange fee is different for the CB cartes bancaires network. I believe the CB cartes bancaires was created in the 80s to reduce the cost for the shops to accept the CB cartes bancaires cards. So the interchange fee, and maybe all other costs related to the cards, were already lower than in any equivalent country. I am not really sure the new european directive changes substantially something in France. Economic newspapers are not writing about that and interchange fees. All the buzz is in the uk ;-). When I had a French CB Visa, it worked in exactly the same way as my UK debit cards in terms of when debits were charged to my account. I closed the a/c in 2012, though, so things may have changed. Bank was CCF, taken over by HSBC. All mastercard and visa cards (issued in France) are inside the CB Cartes Bancaires network in France. CB here must not be confused with Carte Bleue which is the Visa “name/brand ” in France. I’m after the SPG card but was declined back in Feb . Couldn’t see any reason aside from a secondary Lloyds amex triggered a credit check. I’ve since cancelled one card leaving me with one amex issued card. Anyone advise on how long to wait to reapply ? 4 months too soon? You shouldn’t have been checked if you were an additional cardholder? Never been checked with amex issued secondary cards but the Lloyds secondary left a mark . I wasn’t expecting it but shouldn’t have been a surprise given their disjointed IT systems. Use the eligibility checker on the amex website as a guide. I cancelled the old gold charge card, waited 6 months to reapply and got turned down. I had opened a couple of other credit accounts in that time so I think that may have been why. Waited about 5 months and used the checker. It only gave me a 5/10 chance of being accepted for the new gold credit but I applied anyway and got accepted. Thanks Lumma – That’s handy – hadn’t come across that.